A Gaza-bound flotilla’s confrontation with the Israeli navy was delayed yesterday after mystery faults developed simultaneously in two of its boats. The Greek Cypriot government also prevented up to another 30 pro-Palestinian activists – including European parliamentarians – from joining the crafts. The flotilla, now down to five instead of the original eight boats, is carrying 10,000 tons of aid supplies and hundreds of pro-Palestinian activists. It prepared to leave Cypriot waters en route to Gaza last night despite warnings by Israel that it would be stopped – by force if necessary – from landing in the besieged territory. The voyage – the biggest effort yet to break through the three-year blockade of Gaza – had been described by senior Israeli spokesmen as a “cheap political stunt” and “an attempt at violent propaganda against Israel”. But Greta Berlin, one of the flotilla’s organisers, said yesterday that it had been mounted by “intrepid civilians who are doing something [about the siege of Gaza] because their governments don’t”. The Greek Cypriot authorities, under pressure from Israel, refused to allow the boats to dock at its ports. They also prevented passengers who had flown to Cyprus to join the flotilla, including MPs from various European countries, to transfer on to the vessels. Yesterday’s delay came as attempts were made for an alternative embarkation from the Turkish Cypriot port of Famagusta. 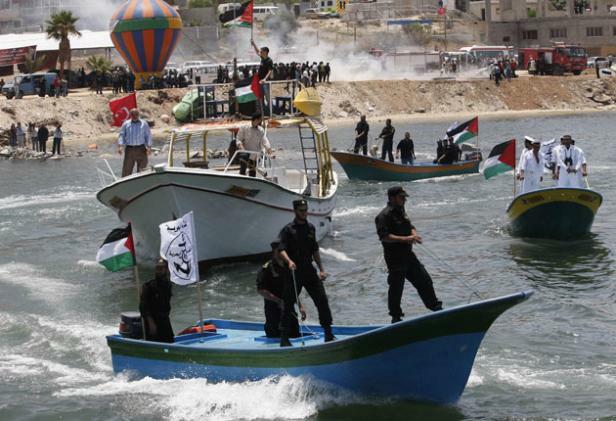 Turkey has been the most prominent national supporter of the flotilla, with its Prime Minister, Recep Tayyip Erdogan, urging Israel to let the boats through. Israel’s alliance with Ankara was severely strained by the 2008-09 military offensive in Gaza. Meanwhile, two of the movement’s small passenger boats developed mechanical trouble at around 3.30pm on Friday as they neared the Cyprus coast from Crete. Last week, another vessel was delayed leaving Ireland by a propeller fault. Israel has accused the participants of betraying their claim to be human rights activists by ignoring Hamas’s attacks on Israeli civilians and internal repression within Gaza. Critics of the blockade argue that it has harmed and impoverished the 1.5 million population of Gaza while leaving the rule of Hamas intact, and even entrenched.